We’d love your help. Let us know what’s wrong with this preview of Summer's End by Audrey Couloumbis. To ask other readers questions about Summer's End, please sign up. I really enjoy reading historical fiction books which this one is. It is about a 13 year old girl who's brother was drafted into the Vietnam War. Her brother burns his draft card starting an outrage with his family. Grace tries to escape the war however it is everywhere and she can't avoid it. Although there were parts that I couldn't understand, I really liked the overall story in this book. It was a bit boring at times but I really liked it once it picked up. One of my absolute favorite historical fiction books EVER! Dealing with family differences about the Vietnam War, the book is realistically told by a 12 year old girl who is stuck in the middle and doesn't know what to think about it. Grace is about thirteen years of age, and she has an older brother named Collin. It's also the time of the Vietnam war and the massacre at Kent State. Collin has burned his draft card, and it's possible he might go to Canada to escape being drafted. The book is about the effect his decision has on the family. Collin's father is extremely angry at what Collin has done. There have been other boys in the neighborhood who have gone and been injured, gone and been lost, and gone to Canada. The father Grace is about thirteen years of age, and she has an older brother named Collin. The father is very “be a man and fight” type of person. The mother is dealing with the fact that the main person involved is her son. Grace is rather confused over everything that is going on, and isn't sure just how to react. 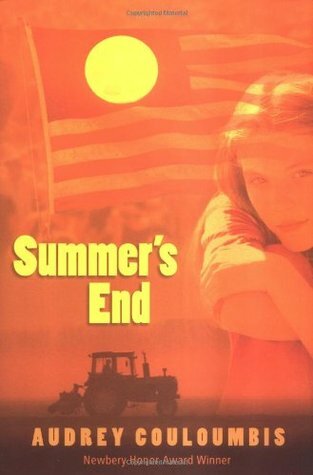 The fourth book I read is called summer's end by Audrey Couloumbus. It is a historical fiction. It is about a girl named Grace who changes her views on her brother Collin. Collin was her older brother who did not want to go into military service and was against the war and Grace's father learned Collin burned his draft card and left to Canada. Grace was stuck between trying to pick sides between her mother and father. She later then discovers that right or wrong she will still love her brother the same way. It can relate to you as a reader if you have an unresolved conflict with someone. I know it had a significant impact on me. In my opinion I felt I related more to Collin because we both have conflicts with our parents. I would recommend this to teenagers. When an older brother leaves for Canada instead of going to Vietnam, what happens to the family he leaves behind? this is a very good book. It includes a lot of descripition. Grace turns thirteen and everything changes for her. The Vietnam war is getting closer and Grace's brother Collin is drafted. Audrey is a recently transplanted (yet again) New Yorker (by choice), now in Bunker Hill, West Virginia (also by choice), where Civil War ghosts scare the dogs at night, where a CSX train track runs behind the house and the romantic sound of a faraway train can be heard three or four times a day, where she is starting a new garden of rambling roses and assorted deer-resistant flowering shrubs and Audrey is a recently transplanted (yet again) New Yorker (by choice), now in Bunker Hill, West Virginia (also by choice), where Civil War ghosts scare the dogs at night, where a CSX train track runs behind the house and the romantic sound of a faraway train can be heard three or four times a day, where she is starting a new garden of rambling roses and assorted deer-resistant flowering shrubs and renovating an old house. Leisure time, what little there is of it, is spent watching how-to acrylic painting videos on youtube and occasionally getting out the paints to play.